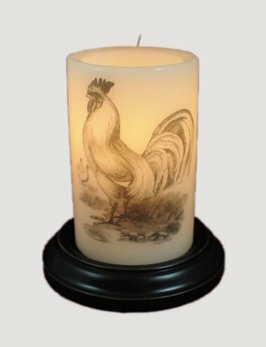 Here's a classic favorite of the farmhouse, the Vintage Rooster Candle Sleeve. The brown sugar coloring gives the hand poured wax a vintage look that's sure to give a finishing touch to any room! Here’s a beautiful addition this Christmas, the Gumdrop Snowflake Candle Sleeve. The candle sleeve is made in the USA. 6 watt bulb and the base of your choice (Antique White, Chocolate & Black) are all sold separately on our site. 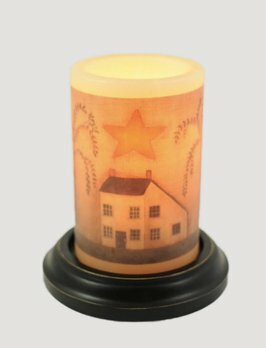 The classic Cotton Home Winter Vanilla Candle Sleeve brings a beautiful glow to any room. This candle sleeve is made in the USA. 6 watt bulb and the base of your choice (Antique White, Chocolate & Black) are all sold separately. A great gift idea! Here’s a timeless way to remember Christmas, Vintage Print Walking Santa Candle Sleeve. The candle sleeve is made in the USA. 6 watt bulb and the base of your choice (Antique White, Chocolate & Black) are all sold separately on our site. 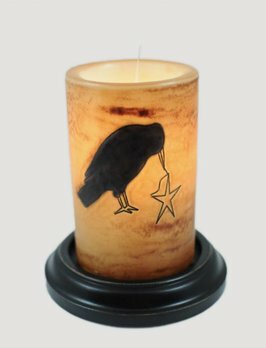 Primitive Crow features an Antique Vanilla finish. This classic Rooster brings an elegant touch of the farm to any room in your home. Add the glow of candlelight, without the worry of a burning candle. Peace of mind and it’s beautiful! 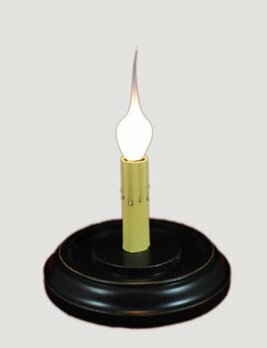 Here’s a beautiful gift idea or addition tot your home, the Library Jingle Candle Sleeve. The candle sleeve is made in the USA. 6 watt bulb and the base of your choice (Antique White, Chocolate & Black) are all sold separately on our site. A classic black crow perfectly perched on a picket fence keeping watch up high. Easy to add to your fall and Halloween decor! 6 watt bulb and the base of your choice (Antique White, Chocolate & Black) are all sold separately on our site.